The year is 2041 and humans have made it to Mars. The first small team of humans is on the planet and is in the midst of research that may lead to making the planet habitable in the not so distant future. However, they are caught off guard when a being is discovered who has been living on the planet for over 65 million years. The being calls herself Oracle and she has been waiting for the children of Olympus to find her so that she may tell them her story: a story of when Mars was known as Olympus and was ruled by a powerful being named Zeus. Her story reveals to the small team of researchers that what humans believed to be fictional characters in mythological stories were actual people who once resided on Olympus until a feud between the different Castes to rule the throne of Olympus brought the once powerful world to ruin. Due to this downfall, all of humanity is now in more danger than could ever be imagined and will, if this danger cannot be thwarted, face a fate worse than death. The modern-day story mythology fans have all been waiting for can at last be read and enjoyed by readers everywhere thanks to author Richard Paolinelli. 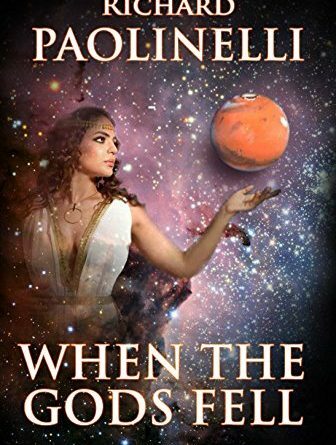 His latest novel When The Gods Fell is a sci-fi/ fantasy wonder that is difficult to even summarize because there is so much that happens within this story, but if readers should know anything before starting Paolinelli’s latest novel, it is this: that they are in for one heck of an enjoyable ride. 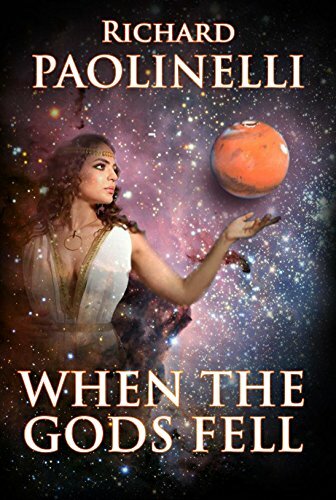 When The Gods Fell has everything: prophecies, space travel, gods, God, mythology, theology, politics, plotting, alliances, backstabbing, the past, the present, the future, the list goes on and on. It is a story to boggle the mind as it shoots down every assumption readers come up with and leaves them undoubtedly wanting more come its riveting conclusion. Mythology has already come up quite a bit for that is this story’s main focus. True, modern day humans (or more future humans since it takes place over twenty years from now) do make an appearance; however, the gods of the world’s mythology are the main focus in When The Gods Fell. What makes the mythology aspect even more exciting is that Paolinelli has accomplished what so many readers have been wanting, but have yet to truly find. He didn’t focus on just one specific mythology or even a mere handful: he included ALL varieties of mythologies. Greek, Hindu, Chinese, Egyptian, Navajo, Japanese, African, Apache, Babylonian, Norse, and more have interacted with one another at last. Readers may think that with so many different stories and cultures merging that it would make storytelling near impossible, but Paolinelli has succeeded in this aspect. Readers will find themselves recognizing many of the characters as well as their Castes and Houses, named after places these characters reside within their respected mythologies. They will also discover new mythologies they may not have heard of yet which provides excellent new reading material in the near future. Granted, with so many different races intermingling, there is bound to be tension and feuds that arise. Paolinelli thought of this, as well, and did very well when plotting his feud. Zeus has ruled Olympus for a century and upon his celebration, there are others who wish to sit upon the throne themselves. Alliances form between different Castes, but then backstabbing and betrayal are also present. Readers may feel that it is very much like a mythological game of thrones and it is even mentioned in the synopsis that When The Gods Fell is “A game of thrones on ancient Mars!” There are times when it is difficult to follow along with who is who because there are so many names and so many Castes and Houses, but the further along readers get, the more familiar they will become with the characters, both known and unknown to each individual reader. There is another important element that goes hand in hand with Paolinelli’s mythology references and those are the references to Christianity. This may be the element that makes readers say no to this story since religion can be a touchy subject nowadays, but readers, please do not let this stop you from reading this story. Paolinelli was careful when mixing mythology and theology together and created a story that is incredible with his own unique twist on some theological references. In this story, Lucifer is Yahweh’s son and, rather than casting him to Hell, Yahweh cast Lucifer to a prison that could only be described as a Hell to the Devil: he and his followers were imprisoned on Gaia, the third planet from the sun in the solar system. Two centuries have passed since he was cast away when the war for the throne ensures, yet Lucifer waits for the day he can have his revenge against his Father. No more can really be said due to possible spoilers, but there are so many levels of this story and these levels, both mythological and theological, truly reveal just how creative Paolinelli is with his storytelling. When The Gods Fell is full to bursting when it comes to everything that is found within its pages. It has everything fans of science fiction, fantasy, and mythology are looking for and more. Readers will recognize many mythological references and will wish to learn more about the ones they are not as familiar with. They will be intrigued by how the different gods interact with one another and the alliances and betrayals that form between them all. They will be amazed at how Paolinelli has made the impossible sound plausible with his carefully crafted storytelling and his wondrous imagination. When The Gods Fell hints at the first of a possible series of unknown length, but readers can only hope that the next book comes out sooner rather than later. And to the talented author behind his most recent novel: Well done, Paolinelli, well done.